“The soul reveals itself to itself through movement. Energy-infused undulations and gestures. Of hand, foot, spine, face and form. The invisible loves the visible.” Bhairava Tantra. I love yoga. So much so I became a teacher. I teach Vinyasa Flow Yoga and our yoga lineage is through ISHTA (Integrated Science of Hatha, Tantra and Ayurveda) in New York. Alan Finger, the co-founder, was taught by his Father who was taught by Paramahansa Yogananda, who famously wrote Autobiography of a Yogi after bringing the practice of Yoga to America in the early 1900’s. Alan Finger’s wife, Sarah Platt-Finger, the other co-founder of ISHTA New York, is Deepak Chopra’s personal yoga instructor. 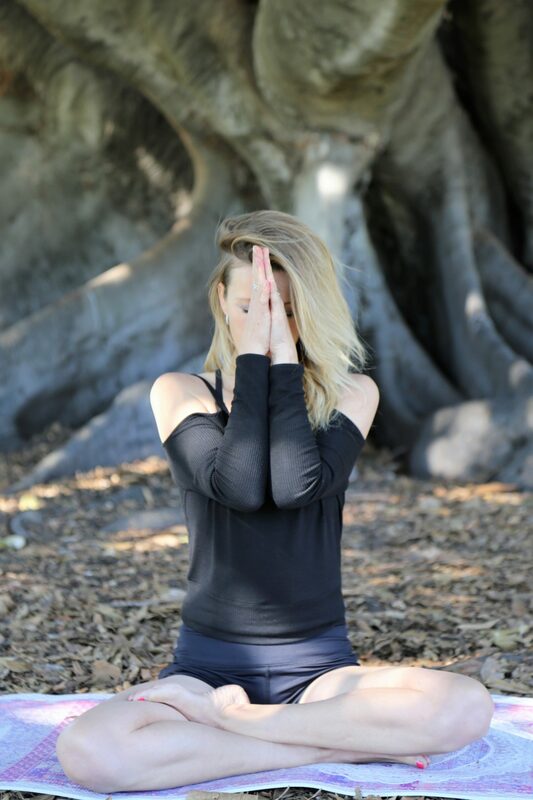 I feel so privileged to have learned this deep practice of yoga through Tamara Yoga in Perth. I have been practicing yoga since my teenage years but never consistently. In 2010 I was 32 weeks pregnant with my little girl Sophia when her heart stopped beating. She was stillborn and I held her in my arms for a couple of hours before letting her go. The grief was partly over losing her and partly for losing the future I had so perfectly mapped out in my head. I refer to Sophia as my Present. She showed me that I was not living in the present moment. Never in the now. Always one step ahead and not paying any attention to all the beautiful things happening to me as they happened. I didn’t feel her stop moving for a couple of days because I was in my head, busy, busy, busy. The counsellor we saw after she passed suggested that I deepen my practice of yoga and start some meditation. I have no doubt that this counsellor was sent to me by the universe, to show me how to continue on my path to stilling the crazy, unreal thoughts in my head and concentrate on what is. We want to be perfect at everything, straight away and we forget that there is a starting point for everything. How will our children look at up to us if we always have to be perfect and never do anything we are not immediately good at? This is a cause of extreme anxiety in our society. This unwillingness to be a beginner at anything. To be perfect at everything we do. We don’t branch out, we don’t leave our comfort zones. Flexibility comes with time but first you have to be flexible in your mind. Open to learning again. To spending time in yoga class practicing the skills that are presented to you. It’s called Yoga Practice for a reason. We are never “finished”, it’s a continuous, unending practice. The deeper you go, the closer you get to your true self. It’s a pursuit worthy of your time, worth the foray into the unknown. The biggest learning from Yoga and Meditation has been that my thoughts are not real. My God I used to think some amazingly out-there stuff. Created scenarios that I truly believed. Came up with reasons for people being the way they are, for their behaviour. We can never know somebody else but we can ask them why and listen. Don’t let your mind convince you that it’s right. We create a fictional “reality” and then it colours everything that we do. The mind is an incredible tool for planning and executing creative vision but we mistakenly think we are our mind. We are not using our mind, it is using us. When you can step back and see that you are separate to your mind, that you can watch your thoughts. It’s truly enlightening. Inner Peace is my focus but what does that look like? It is something that I strive for everyday. I sit with it on my meditation cushion and it is my intention each time I set one in a yoga class. It looks like stillness when other people are complaining, in a bad mood. It’s evenness of temper. It’s the ability to see what is real and not get caught up. I want my boys to grow up knowing that despite everything that is happening outside that you can be calm on the inside. Getting caught up in the drama, gossiping about people, telling white lies, clinging to things and expectations will never make you happy. It gives you a little high at the time feeling part of something but it’s not real and your mind will make you feel guilty about it later. It’s about not judging and not feeling guilty. It’s about being in the present moment and not worrying about the future, which is a complete unknown. Inner Peace is possible in this fast-paced society. Absolutely it is. Turn off your phone. Go out in nature. Watch a sunset. Read a book. Snuggle down and watch a movie with a loved one. You will feel it. It may be small and fleeting right now but the more you practice yoga the longer that feeling will last. The more you practice any one of these things the more inner-peace you will feel. If you are practicing all of them ….well you just may find everything you have been looking for in life. Why are we so resistant to slowing down? The ego, or the voice in our head, loves to judge. It compares and it makes us feel superior or inferior to others. We hate that feeling of inferiority and so we do everything in our power to stem that feeling. That may mean more University degrees, a higher paying job, working longer hours, spending more on clothes, hair and make-up, taking our kids to more activities. The ego ensures that we feel that we always must be doing to feel this way and it disregards “being”. Resting, relaxation, inner-contentment, laughing, sleeping – these are things that we want to do and we covet others when we see them do this. Our ego, however, tells us that we won’t be “good enough” if we slow down like this. So we don’t. We overcome it by screwing over the voice in our head and taking the holidays, going to sleep at a decent time, spending hours at yoga, reading a book on a Sunday instead of planning for the week ahead. Why do you think we are pinning photos and posting on Instagram all the sunset pictures, the hammock relaxations, the island holidays? Because we want them. We need them. We deserve them. Yet our ego says we don’t. Stop listening and understand that the ego isn’t you and that you can quieten the voice in your head. How can you be more calm? How can you stop over-whelm in this life? For me the most helpful has been having an intention of inner-peace. Everything starts with intention right? You can’t even move your toe without the intent do so. You have the intention and then you focus on what you want and do the work. I get up every morning, regardless of the time, or how late we are or how much I have to do and I sit on my couch and I meditate for twenty minutes. The boys will still talk to me, ask me for food, or sometimes just curl up in my lap but everyday I show up there and ask the Universe for help in making me the most calm, productive, amazing version of myself. When I do find myself over-whelmed despite my regular meditation and yoga practice I de-clutter my life. I cancel events, I stop the kids endless activities, I move deadlines, I get rid of the mess in my house, I clear my inbox. Also sometimes overwhelm is because you haven’t had fun in a while. I always make regular dates to go out with friends, with my husband, to go dancing, to get dressed up and really feel good. I make time for girl’s holidays, weekends away and long holidays where I get to do nothing and everything all at once. Enjoying yourself is a great stress-reliever and again under-valued in our society. If you are not enjoying your life then really….what’s the point?